We understand that we have addressed your concerns. If you continue to have questions please refer to customersupport@empiretoday.com. Recently, I had met with an Empire Today sales rep. He sold me carpet and vinyl flooring for my house. He also arranged to have both installed on the same day. The carpet install team showed up an hour late and the vinyl team (man and wife) shoed up later. When the vinyl installer unrolled his vinyl, it was damaged beyond use. Rather than going to get another roll he opted to blow off the day and come back the next day causing me a loss of a day's wages (slightly over $400). The next day the vinyl installer showed up an hour late again. when I stated "you're an hour late" he responded with "do you want me to *** turn around?" (my story, the company interviewed the installer and he stated something different). When I called the company to get reimbursed for my lost wages, I was given the run around and for over 4 weeks did not receive a return call. Finally, after contacting the operations manager, a regional manager called and offered $100, 25% of my loss. I declined am am contemplating my next move. Do I recommend Empire Today? NO! 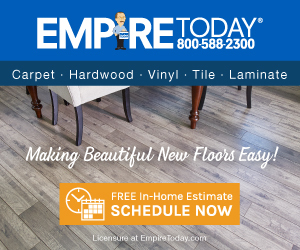 Product or Service Mentioned: Empire Today Vinyl Flooring. Preferred solution: return of lost wages. I didn't like: Lack monetary compensation. Review #845183 is a subjective opinion of psmulian. I am having a problem with them two. Am waiting to hear or an air conditioning mechanic. When Empire did the trim on my floor they busted a pipe and now aircon messed up. Plus, they came three times, each time didn't have enough material. Half of it was done, then had to wait a week for order to come in. The whole deal has been a nightmare. We are extremely disappointed to hear the issues you have been experiencing and regret that your installation has not been completed as scheduled. We will follow up with you shortly to address your concerns.